When I was pregnant, any time I mentioned that I was going to cloth diaper my baby I was surprising met with negativity. Friends and family couldn’t seem to understand why I’d choose to use cloth when disposables were so much easier and more convenient. It wasn’t often that I explained my reasons (environment, less rashes, money, etc. ), because well, it was my decision. Most people asked if I’d have a diaper service or wash at home. If you know anything about cloth diapering these days, you know that washing at home isn’t nearly as difficult, or gross, as people think. 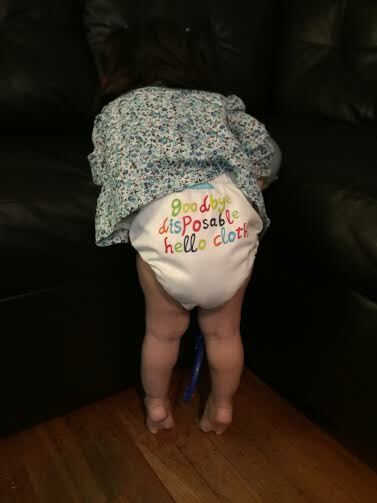 From the beginning I planned on cloth diapering when I was home with baby, and using disposable while I was out. 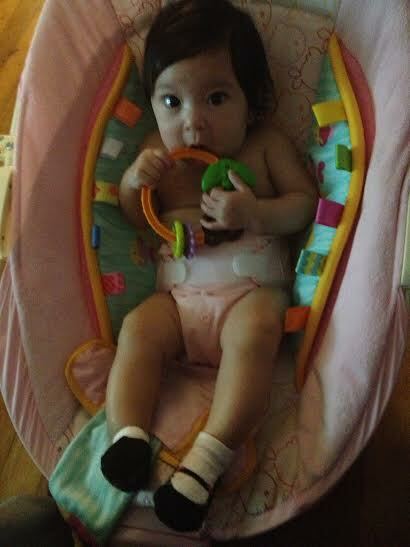 When MJ came home from the hospital I was strict about cloth, even when out and about. Unless she was with a relative for a few hours, she was in cloth every minute and I was proud of myself. When I went back to work when MJ was 8 months, I didn’t expect my hubby to continue cloth diapering with all of the other things he had going on (homeschooling our son, taking care of a baby, running a business, etc. ), but he did for a while, and I was proud of him. I’ve loved my experience with cloth, but I’ll admit that it was a bit overwhelming at first. There are so many different types of diapers (pockets, prefolds, All-in-Ones, g-diapers), detergents, wet bags, etc. It was a lot to learn, and I learned that for me, simplicity is best. Aside from the cuteness of the diapers,I love that cloth in general are all super soft and gentle on MJ’s sensitive skin. When I’m home, we often use cloth wipes with homemade solution as well, and coconut oil is a must for us at every change. I remember someone saying “Cloth diaper? We’ll see how long that lasts.” Well, now MJ is 15 months and we still cloth diaper, although now part-time. Sometimes we g-diaper, sometimes prefolds and covers, and sometimes pockets, but I’ll admit that Huggies are on MJ more than I’d like. It works for us for now. Disposables are not eco-friendly and in my struggle to be more green I occasionally feel guilty about that, but in the busyness of life, I know that we have to do what works for us, and part-time is what works at this point. On this day, in this moment, I’ll be content that I can sit back and smile at MJ running around the living room, barefoot and in her Charlie Banana. Thanks so much! I agree that using cloth, either part time or full time, makes a difference. Please continue to visit and read! We use Charlie Banana too!! Yes it is so cute to see baby running around in such cute prints. Your baby is a little cutie! Thank you! We use CB and a variety of others. We used only CB MJ was a newborn bc it was all that fit her well.